Artist's Conk, Ganoderma applanatum, is a somewhat common fungus found on rotting trees and stumps. If you've spent any amount of time in the woods you've probably come across this large, wood-like conk. It's a perennial structure and adds a new, white spore producing layer on the underside every year. Cutting through one reveals a stack of brown layers, each layer was a previous years spore producing layer. A. Broken Artist's Conk showing old layers with new, white spore producing tissue developing. B. Looking down at the top of an Artist's Conk. C. Artist's Conks sometimes have these brownish drops on their undersides. I think it coincides with growth of the new growth, but I don't know what causes it. D. New growth starting to discoloring with age. E. Just thought it looks cool. F. Note the brown spores dusting the bark. But a cool as Artist's Conks are, this post is more about an insect that inhabits them: Forked Fungus Beetles, Bolitotherus cornutus. I've come across these beetles a few times, and they were brought to my attention again this spring. The spend almost their entire lives on or near Artist's Conks, from egg to adult beetles. There's actually quite a lot written about Forked Fungus Beetles, so instead of repeating what's already out there, I'll share a few links. 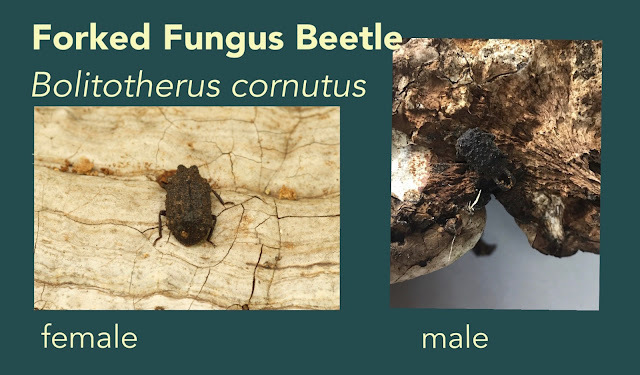 Good overview of Forked Fungus Beetles. Over one hundred images and some interesting comments. Even if you don't feel like reading more about the Forked Fungus Beetle, I highly recommend stopping at the next stump with conks you come across and taking the time to look more closely.